Chris Hughton has insisted speculation linking him to the manager's post at West Brom is just that, with the Birmingham boss fully focused on his side's upcoming play-off bid. Chris Hughton has insisted speculation linking him to the manager&apos;s post at West Brom is just that, with the Birmingham boss fully focused on his side&apos;s upcoming play-off bid. As yet there remains no vacancy across the midlands at The Hawthorns but current Baggies boss Roy Hodgson is believed to be on the verge of being confirmed as England head coach after four-hour talks with the Football Association yesterday. 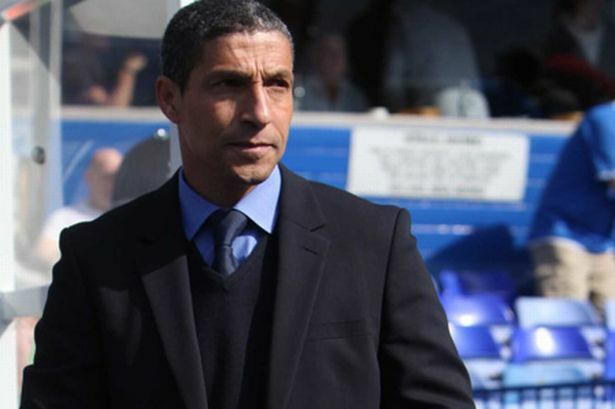 Hughton was interviewed for the Albion vacancy early last year before Hodgson was eventually appointed as the new man in charge, with the former taking the helm at St Andrew&apos;s later that summer. Almost 12 months on and Hughton&apos;s stock has risen further, battling City&apos;s well-documented cash-flow problems and putting together a new-look side which impressed in the Europa League and FA Cup before eventually finishing fourth in the npower Championship. That has provided a crucial play-off semi-final against Blackpool, with the first leg on Friday, and Hughton insists that is purely where his focus lies. "I&apos;m on a contract at this football club and it&apos;s only speculation - non-facts that are brought to my attention," he said this morning at the club&apos;s Wast Hills training ground. "It&apos;s always very difficult to talk about things that are hypothetical and things that are very non-fact. "I have a contract at this football club, we are in a good place at this particular moment because the focus is on these play-off games. "It&apos;s very difficult to speak about anything that&apos;s not fact." He added: "At this moment, it (the play-offs) are taking 100% of my focus." Asked about his previous talks with Baggies chairman Jeremy Peace in early 2011 as the Black Country club looked for a successor to Roberto Di Matteo, Hughton replied: "I think it was no secret at that time, but it&apos;s something that&apos;s very much in the past." Hughton received a rousing reception at the club&apos;s end of season awards dinner last night as Birmingham fans clearly showed their affection towards their manager. Winger Chris Burke was the big winner on the night as he scooped Player of the Season and Player&apos;s Player of the Season. Asked about the rumours, Burke told Press Association Sport: "It&apos;s for the press to link him to West Brom or whoever else, I&apos;m sure he would have been linked if there was another job in the Premier League. "Obviously if you&apos;re a good manager you&apos;re going to get linked. "For me, he&apos;s helped me ever so much in my career and it&apos;s only been one season. That speaks volumes and I&apos;m sure I&apos;m not the only person in that changing room who would say exactly the same thing. "He&apos;s a manager who&apos;s very, very grounded and he knows everything about the club, he knows his players. Hopefully we can achieve something together."